Figure 4.23 Contributions of reactions involving N;,05, ClONO,. and HNO, to net production of NO,. The net contributions are divided into daytime and night-time contributions. Over 24 h, net production is approximately zero. Calculated for 45°N on March 21, using the background aerosol SAD. As shown in Figure 4.23, these HNO, reactions contribute 40-50% to the total NO, production in the lower and mid-stratosphere and smaller amounts in the upper stratosphere. Production of HNO, through reaction (4.42) and loss of HNO, through photolysis and oxidation all cease at sundown, so HNO, is neither a source nor a sink of NO, at night. where the factor of 2 accounts for the fact that two NO, molecules are produced for each N205 destroyed. 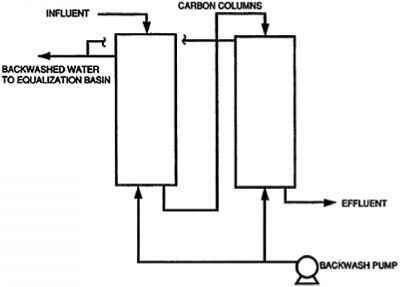 As shown in Figure 4.23. N205 contributes about 50% to the total NO, production in the lower and mid-stratosphere and a few percent in the upper stratosphere. At night, when NO, photolysis ceases, the concentration of NO, increases, and the reaction between NO, and NO, (reaction (4.41)) converts NO, to N,Os at night. As shown in Figure 4.23, this reaction is responsible for the vast majority of the loss of NO, at night. Note that in the lower and mid-stratosphere, -90% of the NO, lost at night goes into N2Os, while only half of the NO, produced during the day comes from N,Os, with most of the rest coming from HNO,. This apparent mass imbalance is accounted for by the hydrolysis of N,0, on the surface of stratospheric aerosols (reaction (4.48)). This reaction converts enough N-,0,, into HNO, to ensure that there is. in general, no net production or loss of NO,, HNO, or N2Os over 24 h .
Because of the relatively small amount of bromine in the stratosphere compared to NOv, bromine reactions generally produce and consume a negligible amount of NO,. Bromine reactions can, however, have an important impact during periods of both extended sunlight and high aerosol loading, such as that found in high-latitude summer after volcanic eruptions [ 107). This reaction is important only in the upper stratosphere and mesosphere owing to the low abundance of N atoms at lower altitudes , As discussed previously, this loss process in the upper stratosphere and mesosphere causes the abundance of NO, to peak in the upper stratosphere (Figure 4.18). Considering the stratosphere as a whole, the abundance of NO, is determined by a balance between stratosphere production from N,0 oxidation, chemical loss of NO,, in the upper stratosphere, and transport of NO,-rich air out of the stratosphere and into the troposphere, with transport into the stratosphere being generally minor. This family contains only active species, i.e. radicals that are involved in catalytic cycles that destroy 0„ and no reservoir species. This is consistent with the CI, and NO, subfamilies, which also contain O,-destroying species. O('D) is a product of O, photolysis, which implies that the flux of ultraviolet radiation is an important factor in determining the production rate of HO,. As we show later, the abundance of stratospheric HO, is strongly dependent on the solar zenith angle (SZA). Note that formation of N20, occurs only at night, while photolysis of HNO, requires sunlight. Therefore, this cycle requires alternating periods of day and night. Unlike the N205 cycle, the BrONO, cycle runs during the day because the formation of BrONO,, unlike N2Os, occurs during the daytime. At night, photolysis stops, and so therefore does this cycle. Hydrolysis of ClONO, can also lead to production of HO, through a series of reactions analogous to the BrONO, cycle. This pathway is, however, negligible due to the generally slow rate of ClONO, hydrolysis, and will not be discussed further. Oxidation of H, by O('D) will also lead to the production of two HO, molecules [112-114], Finally, at high SZ.As, such as at sunset or sunrise, photolysis of H02N02 is a potentially important source of HO, 1115]. 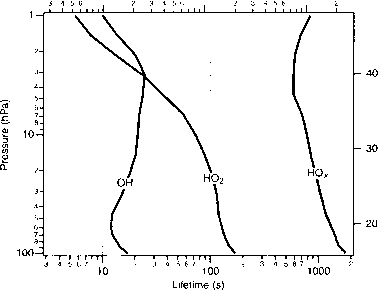 In the mid- and upper stratosphere, the gas phase oxidation of H20 (reaction (4.54)) is the dominant source of HO,. Oxidation of CH4 and H2 combine to contribute -10-15% to HO, production, with the exact amount varying with latitude and altitude. Due to the low aerosol SAD in this region, HO, production through the N2Os and BrON02 cycles is negligible in this region. In the lower stratosphere, the fraction of HO, production attributable to each of these HO, production mechanisms is a function of, among other things, altitude, SZA, length of day. and the aerosol SAD. As in the upper stratosphere, gas phase oxidation of water vapor (reaction (4.54)) is the dominant source of HO,. The N,05 cycle (cycle (4.55)) is responsible for around 10% of HO, production in the lower stratosphere for background amounts of aerosol SAD. The production of HO, from this cycle initially increases as the aerosol SAD increases. Above an aerosol SAD of -5 urn cm 3 (about five times the background SAD), however, the hydrolysis of N205 "saturates" , meaning that increases in the aerosol SAD beyond this point have little effect on the rate of N2Os hydrolysis and therefore little effect on the rate of HO, production. The BrONO, cycle (cycle (4.56)) is responsible for a percent or less of HO, production in the lower stratosphere for background amounts of the aerosol SAD. Unlike the N.O, cycle (reaction (4.55)), however, this cycle does not "saturate" ; instead, the rate of HO, production from this cycle increases linearly with increasing SAD, even at extremely high aerosol SADs. As a consequence, this cycle can become important for large surface area abundances, such as those found after large volcanic eruptions. And as discussed previously, the BrONO, cycle runs when exposed to sunlight, and is therefore more important for regions of the atmosphere that are exposed to long periods of daylight, such as the high-latitude summer stratosphere . N205 and BrONO, hydrolysis reactions are discussed in detail in Chapter 6. Oxidation of CH, and H2 combine to contribute about 20% to HO, production in the lower stratosphere, with the exact amount dependent on latitude and altitude. Finally, HO, is also produced throughout the stratosphere from the destruction of relatively short-lived species such as HOC1, HOBr, and II,02. Usually, destruction of these species is not counted as net HO, production because their formation consumes HO,.. In other words, it is only those reactions or cycles that break an O-H bond in water, a C-H bond in methane, or a II H bond in H, that are considered net HO, production. It should lie noted that this definition of HO, production, while widely made in the field, is somewhat arbitrary. Depending on the situation, other definitions of HO, production might be appropriate. The lifetime of a H atom with respect to this reaction is about 10"^ s in the lower stratosphere, rising to about 0.1 s in the upper stratosphere. 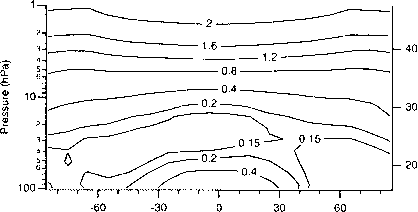 This short lifetime for II atoms translates into small abundances: the ratio [H]/[HOJ ranges from 10 s in the lower stratosphere to 0.01 in the upper stratosphere. As a result of this, one can ignore H in the stratosphere, and HO, can be approximated by the sum of HO, and OH. Further, one can assume that the production of a H atom in a reaction is equivalent to the production of an HO, molecule. Reaction (4.60) dominates the conversion from OH to HO, in the lower and mid-stratosphere. In the upper stratosphere, where O atoms are abundant, reaction (4.61) dominates. Reaction (4.62) is generally minor, except near the tropopause, where it can make a significant contribution. Figure 4.24 Schematic of the partitioning between OH and HO, (the sum of which is HO(). Each arrow is marked with the reactants that facilitate the conversion indicated by the arrow. In the lower stratosphere, reactions (4.63) and (4.64) contribute approximately equally to the conversion of H02 to OH, with virtually no contribution from reaction (4.65). In the mid-stratosphere, reaction (4.64) dominates, with smaller contributions from the other reactions. In the upper stratosphere, reaction (4.65) dominates. The lifetimes of HO, and OH with respect to these reactions are shown in Figure 4.25. This simple equation for HOA. partitioning agrees well with measurements in the lower stratosphere [74,117.]. Figure 4.26 shows a model estimate of the [0H]/|H02] ratio. and are destroyed by photolysis and oxidation to form OH (reactions (4.17), (4.85), and (4.86)). Due to their reasonably short lifetimes (see Figures 4.3 and 4.29), HOC1 and HOBr are in the photochemical steady state during the day (e.g. see Equation (4.25) and the accompanying discussion). As a result, over most of the day the loss of HO, from formation of HOC1 and HOBr is balanced by production of HOr from destruction of HOCI and HOBr. These species do not, therefore, usually represent net sources or sinks of HOA. Figure 4.26 Annually averaged daytime-average [OH|/[HO,| ratio. Values are from the Cïoddard two-dimensional climatological circulation model . The formation of HOG and HOBr consumes HO,, while destruction of HOC1 and HOBr produces OH. Thus, while there is no net change in HO, when these species are in photochemical steady state, there is a net change in the partitioning of HO, In other words, measurements of OH and HO, reveal slightly more OH relative to H02 than is predicted by the simple partitioning model in Equation (4.66). A more exact calculation of the [0H]/[H02] ratio must include terms to account for this . Model estimates of the OH and HO, abundance are plotted in Figure 4.27. Global measurements of HO, species in the middle and upper stratosphere have not yet been made, but profiles can be found in the literature [92,118-123], In the lower stratosphere, there is a large database of HO, measurements. 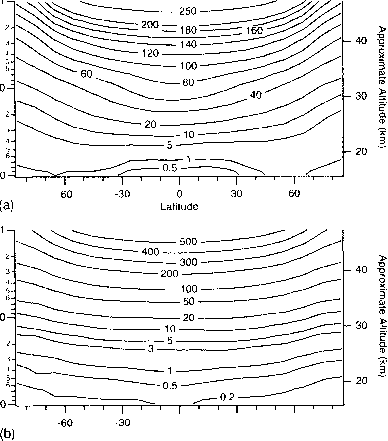 Measurements of lower-stratospheric OH obtained at a range of altitudes, latitudes, and NO, O,, and H20 abundances are shown in Figure 4.28 plotted against the SZA. Surprisingly, the measurements show a strong correlation with the SZA, implying that variations of the other geophysical parameters have little affect on the OH abundance , In general, current photochemical models of HO, reproduce the stratospheric FIO, measurements reasonably well [74,123-125]. The rate that this cycle destroys HO, is 2£()lMIO [0H][H02]. In the mid- and upper stratosphere, virtually all of the HO, loss is from this reaction.